I particularly enjoyed this piece. It would have been easy to show off this breed with a non-descript "mushy" background, but I feel this approach tells more of a story. Now that I have completed several dog pieces for the upcoming Wingshooting USA series, it is time to go back to wildlife. I have a big, big project and you'll be able to see it from start to finish. Now comes the really fun part. 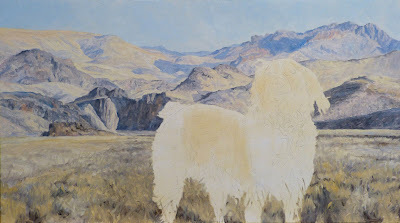 Much as I enjoyed playing with the background, once I hit the animal I feel I am in my element. Like usual, I began with the eyes. If I can nail them, the rest of the animal seems to flow. From there, I moved to the nose, mouth, then filled out the rest of the head and moved to the neck. Hmm. This hair is going to be slow-going. To create a 3-D feeling to the hair (but not make it look stiff) will take strong dark edges, then blending. 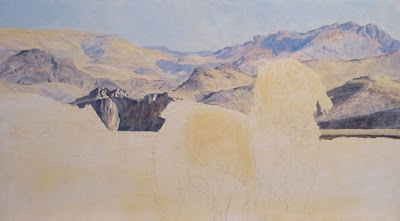 The section I have done so far has gone through several stages of adding sharp darker lines then softening the edges with my favorite blending brush. With the hillsides done, I moved on to roughing in the grassy area. Just blocking in this section will give me a base from which to work. 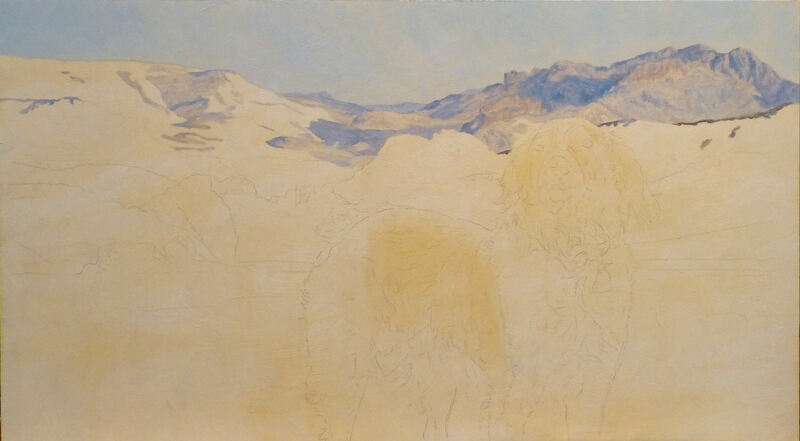 I'm not going to fuss with this too much and will revisit it once I finish the dog. This is a fascinating landscape. 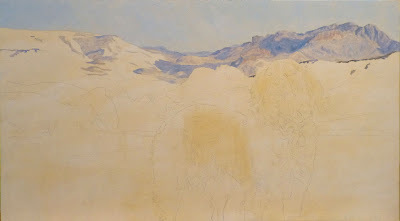 I'm finding that in painting it it is even more interesting. The contrast of the warms and cools create their own drama. And if I enhance the contrast just a tad for effect...you won't tell anyone, will you? For this dog portrait I wanted to take a different approach. A Brittany is not only a good family companion, but also a renowed hunting partner. Rather than a loose non-descript background, I decided to depict some of the chukar territory in eastern Oregon for a backdrop. I'm finding this setting a lot of fun to paint. 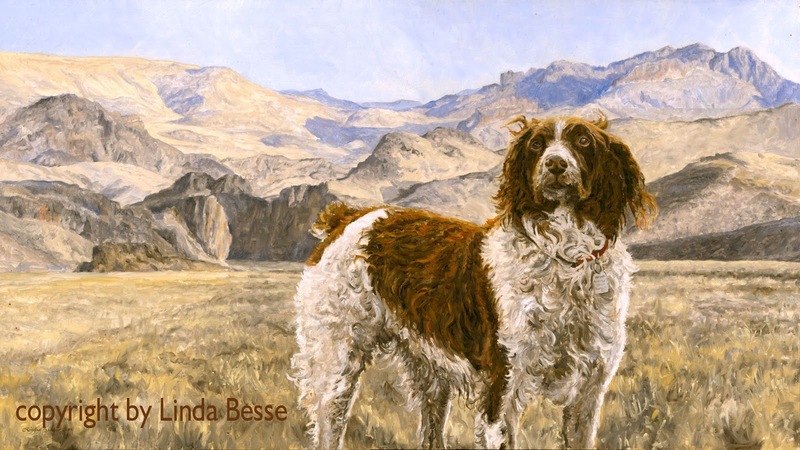 For my upcoming﻿ stint on Wingshooting USA starting this Fall, I had two more dog paintings to paint. They aren't my "traditional" subjects though lately it might be difficult to determine what my traditional subjects would be! As always, I think it is good for a painter to try new things. 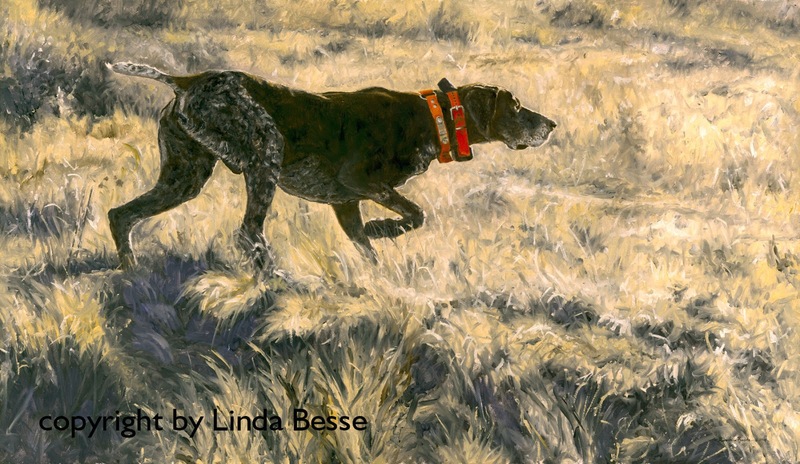 As I delve deeper into the field of sporting dog paintings, there is a lot to learn. My main goals are to understand the particular dog and its breed characteristics, and most importantly, to say something new. 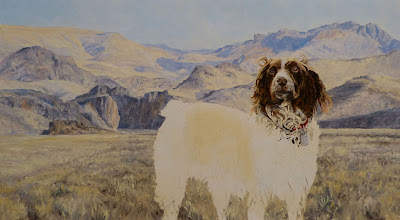 Man's best friend has been painted for centuries. What new can be said? Each painter will have his or her own style. That can contribute to the new but there has to be more. A new story, a new perspective. Some sporting dog paintings have used the dog-bird-hunter-barn formula. And I have seen some tremendous art with those elements. I have also seen some which says the same story except with a different dog, or hunter, or barn. In order for me to evoke a different emotion in each painting, I need to tell a different story each time. That is part of the challenge but also part of the fun. Who wants to read the same book over and over again? Last weekend (February 28th - March 3rd), I was at NatureWorks in Tulsa, Oklahoma. This is one of my favorite shows. Not only is the venue elegant but the directors of the show spoil us rotten. This year, with fewer artists, the directors decided to increase the ballroom space we used. With a very open floor plan, the show had a decided upscale feeling and look. It rivals the finest shows in the country. Beyond the high sales the show generates, it also is a family. My artist friends make up the show and this year we had some extra time to spend together. Yes, another artist could be considered competition, but it doesn't feel that way. We are thrilled when one of our friends has a good show. With the layout this year I had two sculptors near me. Diane Mason was next to me and Paul Ryan was across from me. Both are very talented and seeing their unique 3-dimensional approaches to wildlife was a joy. Diane had a rooster which has so much life I thought I could almost hear the crowing. Paul's show-stopping gigantic dung beetle with dung ball was a hit and my favorite sculpture in the show. My thanks to the NatureWorks Directors and the whole staff for putting on such a fabulous show. One of the reasons﻿ I paint small pieces is to play with some ideas. 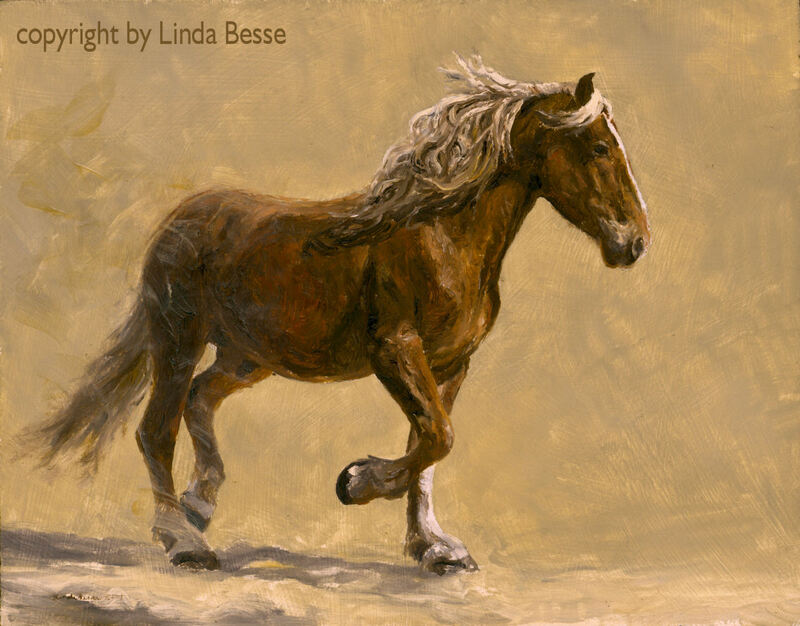 Here I wanted to paint the essence of horse. 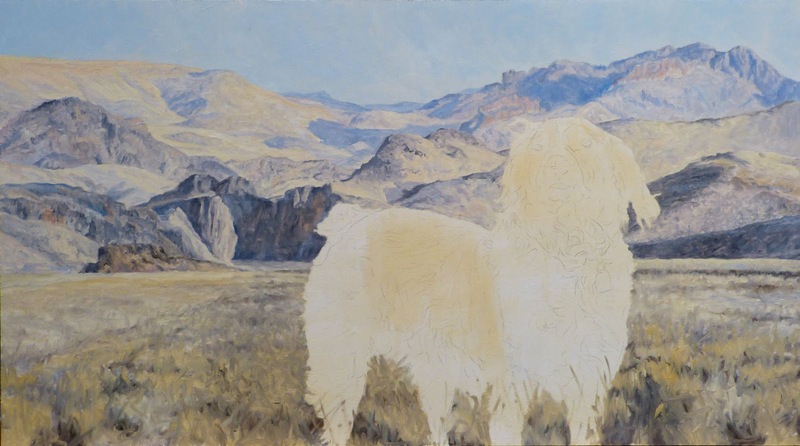 Eliminating the background and having the horse "emerge" from the painting were some fun artistic choices.